This Zoom H6 Recorder Podcast Kit with enCORE 100 Mic from B&H brings the elements necessary to begin recording a 1-person podcast within minutes of opening the box. The Blue enCore 100 dynamic microphone features a cardioid pickup pattern that does a great job capturing speakers near the mic but without picking up unwanted sounds further away. The included Auray telescoping tabletop stand makes positioning the mic a snap. The XLR cable plugs right into the H6 recorder, which features high-quality mic preamps and records to an SD card. The H6 sports three other XLR/TRS inputs when you're ready to add more guest mics, and it can be expanded to accommodate up to six mics with the EXH-6 dual XLR/TRS combo input capsule (available separately). The recorder also features easy-to-reach controls and a large, full-color LCD display angled so it's easy to read in all environments when making on-the-fly adjustments or editing in the field. The system is fully standalone but also ready to interface with a computer for live streaming or for more elaborate post-production work. 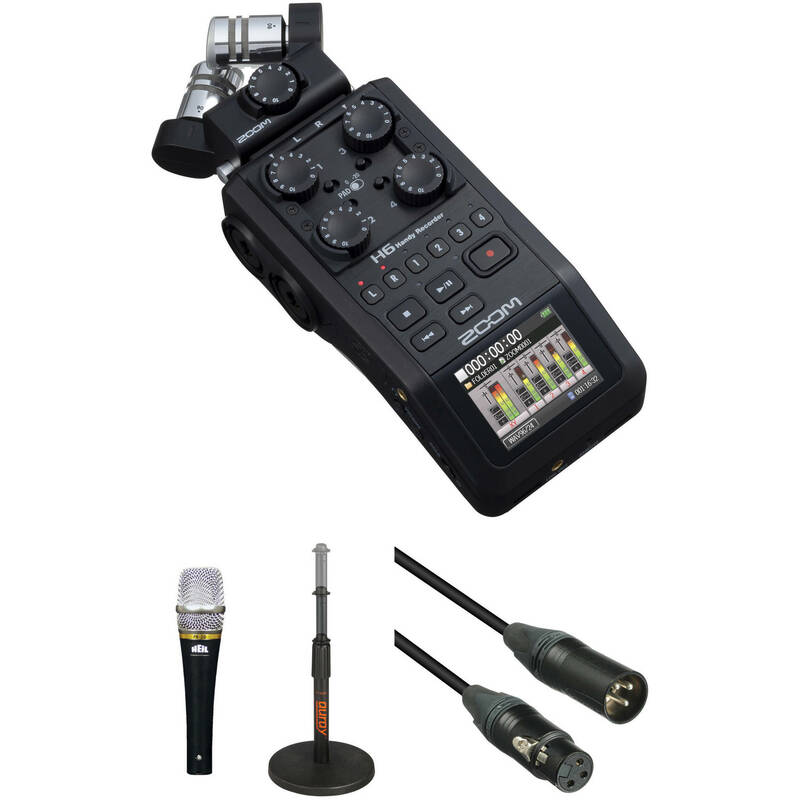 H6 Recorder Podcast Kit with enCORE 100 Microphone is rated 4.8 out of 5 by 285. Rated 5 out of 5 by ajs from well designed audio recorder I will use with my Nikon D800e. I did a test and it held sync at 29 minutes. I have heard not all Zoom units are consistent with sync,, but mine does great. I may also use this with my Sony z1u when I need more mic inputs. Its much better to mix the mics in post. user friendly design. I just ordered the xlr input attachment so I can record 6 mics at once. That came up a couple of times when I recorded a TV talk show. It comes with Cubase but I found out I can interface with my Logic pro 9 I can't record to the recorder and use as a interface at the same time. that would be nice for backup, but not essential.. Rated 5 out of 5 by James from Highly recommend Unbelievable sound reproduction from a hand held device. I recorded an outdoor concert of a friend of mine and even the band was amazed at the sound quality of the recordings. The stereo separation with the XY mic was incredible. the ease of setup and the intuitive controls made it easy for even me with no prior audio experience to record a high quality GREAT SOUNDING Concert. I have recorded 2 events so far and recorded 4-5 hrs of audio and still have 3/4 batty life on 4 AA batteries. I added a 64 GIG card and haven't even scratched the 5% mark on usage at 96.0 K 24 BIT recording. Highly recommended. Rated 5 out of 5 by Jonathan from Beware the wind! I posted a glowing review of this recorder earlier but I would like to add an update. The built-in microphones are insanely sensitive to wind noise. You CANNOT use this thing outside without a very good wind screen on the built-in mics. I mean the slightest movement of air is death to the sound quality of the built-in microphone. The AGC will pump and the rumble makes the audio worthless. Also, it absolutely cannot be hand-held while recording with the built-in mic. The handling noise transfers right to the mic. You need to have it on a tripod. Rated 5 out of 5 by JBLR from A very well designed product The H6 is one of the better designed products I've run across in a long time. It is loaded with design features and is very well thought out. The menu is easy to use and provides a pleathera of options. I have never owned a audio recorder like this before but now realize how valuable it would have been to me in the past. Owning a considerable amount of professional A/V equipment I can see now that this product is bound to be one of my favorites. And best of all it has XRL plugs I can use my multiple mics with even in locations far from my video cameras. Needless to say, I'm quite impressed with the overall design of the products and its many features. Rated 4 out of 5 by Anonymous from So far so good! This is a great tool-- great quality for the price. However, make sure you format the SD card that comes with the case before using it. I didn't, and ended up not being able to transfer the sound files as the card was malfunctioning. The only thing this product needs for documentary film on-the-go production is a perfect case for carrying it visibly with an attached boom pole. The reason that other audio recorders win out for me is that you can see the levels at your side while walking. I don't want to have to touch the recorder to be able to see the levels while booming. There has to be a simple carrying solution for this, I just haven't figured it out yet. Rated 5 out of 5 by Jeff from Legal Videography! I use the H6 for legal video. This is a great machine. Creates an MP3 audio file for the court reporter. I've used it to send line or mic level to my camera while recording an MP3. Gives you the option to offer your reporter a headphone mix independent to your mix. If needed use the headphone 3.5 to the reporters computer for audio, just lower the headphone volume. The additional xy capsule allows you to connect an additional TRS 3.5 lavalier for a 5th controllable input. I even use this with my MXL 100 mic using a 3.5 TRS male to male. Flaw Less. Rated 3 out of 5 by Mdifilm from Still have noise compared to Tascam DR-6 This is a well thought out device, it has a lot of usage, and iLife many reviews, it's good for general purposes. For DSLR filmmakers, you may find it very hard to view the screen or adjust the dials when it is mounted on top of the camera, you CAN use additional supporters like a cage or a hotshoe mount, but it will add more stuff around the camera making it less portable. I have been using both extensively and tested both the Zoom H6 and the Tascam DR-60D and between all my filmmaker friends that had used both devices, the Zoom renders more noise even though it is better than the H4N. Don't get me wrong, it IS a good device but it has its application. I do love the fact I can use 4 XLRs but I hate the menu and option buttons they make it hard to change the settings. Also, the backup recording options ONLY applies to the front modules L/R input not the 4 XLRs. Rated 5 out of 5 by ralph from Zoom H6 forced out my Tascam DR 70D from my setup I had a Tascam DR 70D that first had a problem with the Micro USB power connection, then it had two channels die on me Channel 2 and 4 . Teac the company that produces the Tascam device wanted to charge me $110.00 for labor and then replace the mother board. I was not going to invest into a recorder that will probably have additional problems in the near future. So, I purchased the ZOOM H6 and I have used it on location for a film shoot, it works great. I would recommend this recorder for it's ease of use, great sound quality and easy to connect input devices and connect to video cameras. What is the signal to noise ratio on the Zoom H6? Can this be used to in the following: 3 sounds inputs send to a mixer and one xlr connected to the the H6 recording the mix, as well as USB connected to a MAC for live streaming? Unfortunately, the Zoom H6 will not support recording audio unto the SD card and streaming via the USB. You may want to consider the new sound devices mixpre series recorders as they will allow you to write audio to the SD and stream via the USB; B&amp;H# SOMIXPRE6 and B&amp;H# SOMIXPRE3. Is there a way to plug this into the wall and not use batteries? Yes, the H6 can be powered via USB using either a computer or the Zoom AD-17 power adapter (sold separately). Is there a way to monitor each individual channel through to headphone to check for distortion, etc? You can monitor each track as it s being recorded. Any tips on a case (like a portabrace) that also holds two receivers for wireless lavs? I find with the H4N, it's just a precarious jumble of cables, but at the least the XLR inputs came out on one side. Currently, there is not a case available that will house a Zoom H4N and 2 wireless receivers. You may however consider a Porta Brace AO-1X Audio Organizer Case (B&amp;H#POAO1X). The internal dimensions of 10 x 6 x 6 allows ample room for a Zoom recorder, a couple of wireless receivers and more. Does it have running timecode? The Zoom H6 does not run time code. However, the Zoom F4 and the F8 are capable of running time code. Can I connect the Zoom H6 to a phone for live streaming? Can the back-up recording be used for any inputs or does it have to be only for the L/R mix? and if only for the L/R mix, is there a way to set the L/R mix to be the other inputs? Enter an The back-up recording is only for the L/R mix.answer to this question.